This milestone contains all three parts. But in Part 1, i only have decomposition upto level 1. the part which states”3. Continue decomposition of one process up to primitive processes (Level 2, Level 3, etc. )” is not included here. Moreover, please use it as a sample, this is already submitted so it can help you to prepare your own material. dont submit the solution as it is. he requirements analysis phase answers the question, ‘What does the user need and want from a new system?’ The requirements analysis phase is critical to the success of any new information system! In this milestone we need to identify what information systems requirements need to be defined from the system users’ perspectives. 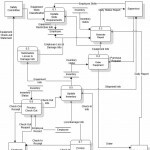 The Data Flow Diagram (DFD) is a graphical representation of system which shows systems structure and components. The DFD shows how the data transforms in the system, what the source of the input is and what is the destination. Also, the DFD presents data structure and how it’s stored. 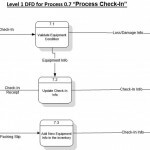 In this milestone you will explode the Context level DFD to Level 0 DFD to show sub-systems (processes). 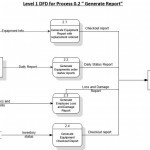 The Level 0 DFD shows internal data stores and how data flows through the processes. hild level diagrams show details and are built till needed level of details is reached. 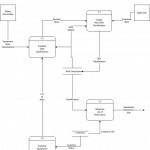 First, we show the information system as a single process on the Context diagram. Then, we decompose and show more details until all processes are functional primitives. Not all processes are exploded to the same number of levels- it’s not required to explode all processes to the same level. The main target is to reach the functional primitive which will be translated into units of program code. 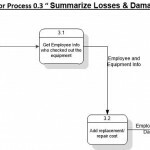 As a systems analyst or knowledgeable end-user, you must learn how to draw data flow diagrams to model business process requirements. The preliminary investigation and problem analysis phases of the methodology have been completed and you understand the current system’s strengths, weaknesses, limitations, problems, opportunities, and constraints. You have already built the Context models (Milestone 3) to document business requirements for the new system. 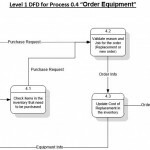 You now need to build the Level 0 (System) DFD and corresponding process models. 1. Develop Level 0 DFD. Make assumptions where necessary. 2. Draw one Child Diagram using the Level 0 diagram. Deliverable format and software to be used are according to your instructor’s specifications. Deliverables should be neatly packaged in a binder, separated with a tab divider labeled “Milestone 5-Part II”. 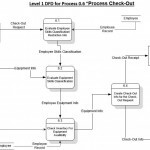 Advanced option is to develop Child diagrams for all processes in Level 0 DFD. The following is a copy of the transcript of an interview you, a systems analyst from Information Systems Services (ISS), conducted with Oscar Barrett, Janine Peck, and S.P. Marsh of the Equipment Depot. The goal of this interview was to determine requirements for the proposed system. Scene: The Equipment Depot. You have scheduled to meet with the Equipment Depot staff just after the 3:00 PM shift change when Oscar Barrett finishes work and Janine Peck starts her shift. S.P. Marsh, the third shift employee has agreed to come in for the meeting. You: Well, here we all are again. I promise you I won’t be meeting with you to death. Oscar: That’s OK. We want to help make sure the system does what we need. each parts of that functionality. I already know the basic functions for the system. wondering if you envisioned you doing the data entry or employees? that they are actually bringing the tool back. That would speed us up. You: Sound good. Now what if the employee loses the equipment he or she checks out? more often than not they don’t report it, hoping they’ll find it in a few days. You: So if they do report it, do you do anything? note of the lost and the cost of the replacement. you’re going to solve all our finding problems, right? You: I’ll do my best. What about when lost equipment is later found? the loss, we erase it. have had if the employee hadn’t lost the equipment in the first place. any way to identify that as a loss. than 30 days. Then we’ll contact the supervisors and have them check it out. locate who had a specific piece of equipment? Oscar: That would save us loads of time. classification determination and communicates that to us as well. then send us notice of that as well. essentially the same as changing the skill classification for an existing employee? when they quit or are fired. order or do different things? replacement or a brand new kind of equipment for a specific job or whatever. Then the order is a separate step. You: Then after the order is placed? of the order. We would like the system check the status. web site. But if we could somehow download that status data, it would be great. Oscar: I suppose it does. I think you are starting to understand this system. You: Well, I hope some. Have we discussed everything the system needs to do? Janine: We mentioned some other reports in our last meeting. You: Right. I already have that information, so I won’t have to ask you about it again. Janine: As you can see, we’re excited about this. Design fast. Each process from primitive DFD may be developed as the individual module. The software design technique which is based on the composing software from separate, interchangeable components is known as the module. Modular design is a way to organize the complex system as a set of distinct components. Components may be developed, tested independently and then plugged together. Sequential – execution of steps one after another. Decision making – execution of step depends on results of condition or set of conditions. Decision making is also called the selection or control. Iteration – execution of steps is repeated until the specific condition changes. Iteration is also called as repetition or looping. In this milestone you will write the Structured English for primitive process. 1. Write the Structured English for primitive process. The goal of this part of project is to write Structured English. 1. Write the Structured English for one-two primitive processes. Include sequential, decision making and iteration logics. Your instructor will indicate what specific processes to document. See on-line learning center website for the textbook. Management and users make important decisions based on system outputs. Outputs present information to system users. Outputs, the most visible component of a working information system, are the justification for the system. These outputs are produced from data that is either retrieved from databases or, more often, input by users. Good input and output design can make the difference in whether or not an information system is used effectively. User interface design provides a roadmap or dialog that integrates the inputs and outputs. In this milestone you will design outputs, inputs, and user interface for the Customer Response System. •	Design a GUI output screen and printed computer outputs. •	Design a GUI input screens that use the proper screen-based controls. •	Design a GUI screen that integrates the above outputs and inputs. The goal of this project is to design outputs, inputs, and a user interface to track employee data. 1. Design at least one of the following outputs for the Equipment Check-Out System: transaction (external/turnaround), detail report (internal), summary report (internal), and exception report (internal). Your instructor will indicate what specific outputs you are to design. 2. Design at least one of the following inputs for the Equipment Check-Out System: source document, client/server screens (e.g., Windows), and web screens. Your instructor will indicate what specific inputs you are to design. The above designs should represent prototypes (thus, include sample data in your designs). To develop the prototypes, use any available tool: Visio, CASE tool, personal DBMS (e.g., Access), or RAD tool (e.g., Visual Basic, MS Visual Studio). Your instructor may indicate what specific design tool you should use. Your instructor will specify deliverable format and software to be used. 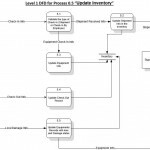 Deliverables should be neatly packaged in a binder, separated with a tab divider labeled “Milestone 5-Part III” and accompanied with a Milestone Evaluation Sheet. Guidelines or additional technical requirements such as data dictionary.